Now that the NFL Draft has come and gone, it’s time to start guessing where the chips will fall and who will be the most sought after pieces of your next fantasy football championship. This is done with PPR format in mind and obviously only considers the information we are currently aware of (i.e. roster depth, injuries, scheme, etc.). So instead of going into serious depth, we’ll just take a look at a few guys that are ready to really produce that you wouldn’t expect otherwise at each position (2 QBs, RBs, TEs, and 4 WRs). Blake Bortles. Jacksonville Jaguars. After an underwhelming rookie year, Bortles came out looking like a 3rd pick overall in his second showing. While he had a higher number of INTs (18) Bortles managed 35 TDs and established a promising connection with emerging receivers Allen Robinson and Allen Hurns. With an improved run game and emerging defense it looks as though the Jags may actually improve this season (though just about everyone in their terrible division did as well). And with Julius Thomas back and healthy, Blake should have plenty of good red zone opportunities as well as fantasy points in hand. Drew Brees. New Orleans Saints. Finally having Mark Ingram step up really helped the passing game. A terrible defense helped a whole lot as well. Turnovers were still a problem for Brees, but some safety valves that weren’t as reliable last year will certainly help the numbers trend upwards. That and he’s getting 20 million to lead a mediocre squad. Willie Snead and Brandin Cooks will both grab a ton of balls and Brees will continue to make his tight ends look like All-Pros. David Johnson. Arizona Cardinals. It’s easy to assume that Chris Johnson won’t have the opportunity to do much. Even while he was running over opponents prior to a season-ending injury, the buzz was around David Johnson and the potential to become a feature dual-threat back. The younger Johnson has great hands out of the backfield and the shiftiness to put defenses on their heels’. Which Carson Palmer will show up to get the ball to Johnson and can guys like John Brown and Larry Fitzgerald have repeat performances of a season ago? All important questions needed to be answered if this guy is going to fulfill the exceedingly high expectations surrounding him. Even with a couple other options to carry the rock Johnson should exceed his small sample sized numbers of last year and get in excess of 1000 yards rushing and 60 catches for 500 yards receiving. Lamar Miller. Houston Texans. 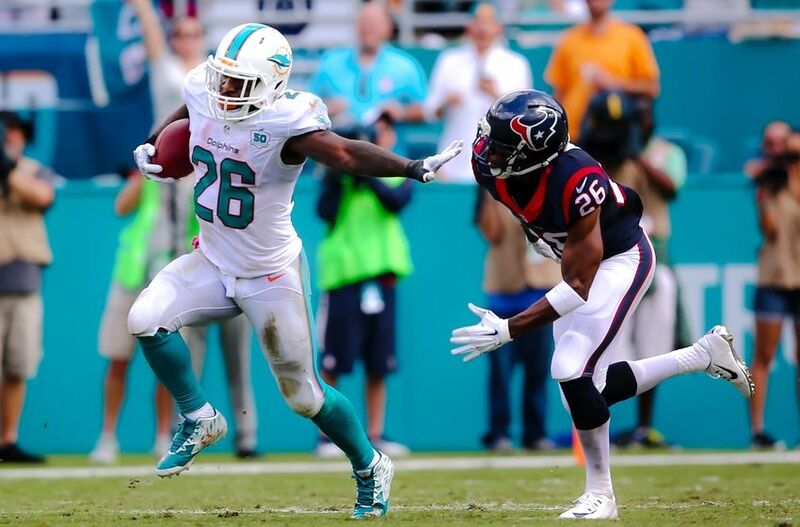 There were few more frustrating fantasy duds that Lamar Miller this past season and it wasn’t his fault. The Dolphins were intent on mixing the run and the pass (and eventually just throwing it every play after they’d get behind by several scores). Jay Ajayi even stole some goal-line touches. But now with the Texans, Miller will be given the opportunity to step in as a vintage Arian Foster-like back both receiving and running the ball. Quarterback Brock Osweiler will need production from the running back to take some pressure off the signal-caller in his first year with the team. A baseline of 1100 yards and 8 TDs along with 45 catches for an additional 300 yards and a handful of scores will be what the expect in the least. Ladarius Green. Pittsburgh Steelers. Even if his time in San Diego was fleeting, Ladarius Green showed that he could play. Still, his motor needs to get going as the living legend of his current city has already retired (unlike Antonio Gates). Green will have the opportunity to step in right away in a high-powered offense that is sure to air it out a little more early while they determine how much Le’Veon Bell can take. Heath Miller was always the go-to guy with Ben Roethlisberger when he needed a first down or a score to stay in the game. There’s just no way around Green not having a breakout season (especially with one less option in the passing game with Martavis Bryant out indefinitely). Coby Fleener. New Orleans Saints. As previously mentioned, Drew Brees can make tight ends look awesome. Sure, Jimmy Graham and Benjamin Watson were both supremely talented guys (as was Antonio Gates in Brees’ first years), but this also points out just how important the position is to the Saints’ offense. 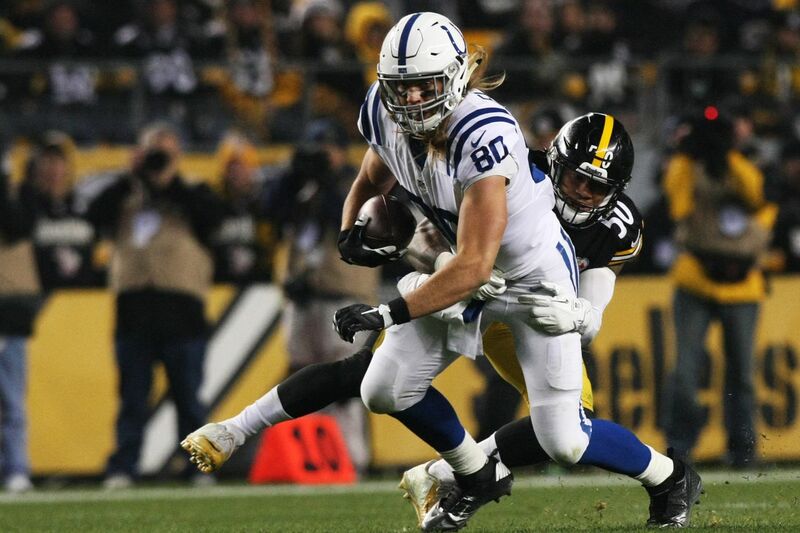 Fleener was supposed to be a breakout star in Indianapolis and instead injuries and inconsistent play between he and Dwayne Allen didn’t help. Fleener will now have a chance to really step it up with a quarterback who’s sure to stay healthy and get the ball to him with regularity. And with some tweener-type athletes catching shorter passes on slants and trips, Fleener may get the opportunity to be a big-play threat in the passing game. Keenan Allen. San Diego Chargers. He only played half the season in 2015 and Allen still had 67 catches for 725 yards and 4 TDs. At just 24, he needs to be the go-to guy that Philip Rivers just didn’t have in the second half of last year (even though he still put up impressive numbers). With no real #2 guy outside of Stevie Johnson, Allen will look to continue the 11+ targets a game that he saw last year. 100 catches (especially in this day and age) is the baseline. Add to that the fact that Allen won’t be a name you think of immediately and likely will fall further in drafts for a plethora of factors (none that make sense, but just watch). Even without a lot of scores (which he was on pace for a solid amount), Allen is a top 10 or better caliber player and he’s one to consider as early as the second round depending on how your drafts play out. T.Y. Hilton. Indianapolis Colts. With less options at receiver and a finally healthy Andrew Luck, there’s no excuse for Hilton not to return to the form of two seasons ago. While his numbers were okay last year, he was boom or bust and often laid eggs directly after monster weeks. His 1100+ yards were really in a handful of good games and the rest of the time he was missing in action. But again, having Luck to read the plays and make the throws will go a long way. Another season playing alongside Donte Moncrief will hopefully helped round out this roster and give Hilton the opportunity to put up top-tier numbers worthy of a 4th round selection. For now he’s looking more like a 6th round or later guy. Golden Tate. Detroit Lions. Perhaps the only person in Detroit not terribly upset about Calvin Johnson’s departure is Golden Tate. Sure, Tate got a lot of receptions based on Megatron’s double teams on the other side of the field. But he was plenty productive in the games that Johnson was out hurt and he actually had 2 more catches overall. The trick will be getting Tate downfield as he only averaged 9 yards a catch last year. Even if he’s a slot guy he’s gotta get more outta each opportunity. My money is on that happening plenty as Matthew Stafford will zip a ball or two to Marvin Jones for 20 yards here and there but will need someone to run great routes every play. Golden Tate is that guy. 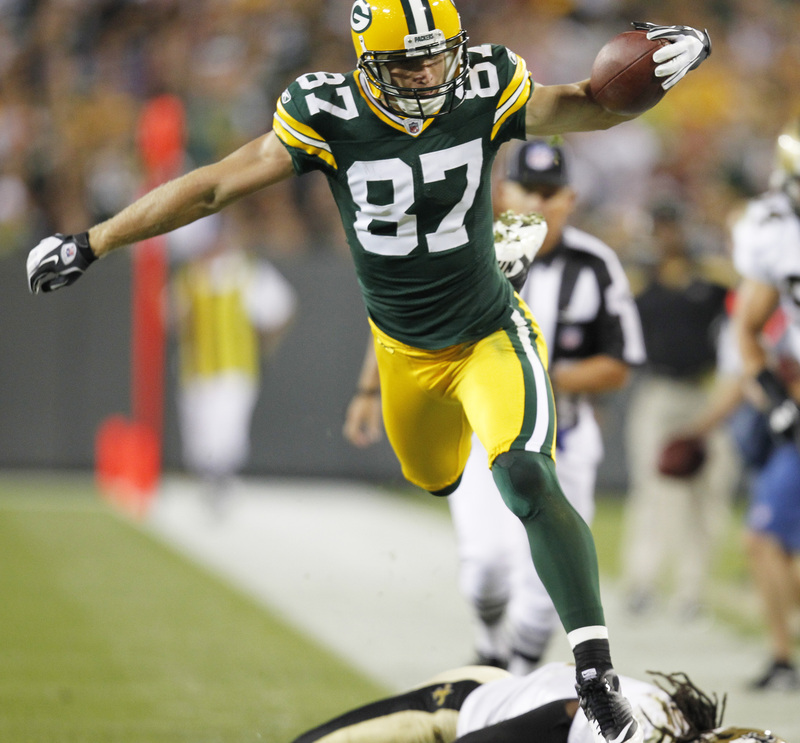 Jordy Nelson. Green Bay Packers. So he’s a top 5 guy in reality. Maybe he won’t be ranked that high when you draft to start the season, but how good was Randall Cobb last year? Not good at all. The same Randall Cobb who torched the league the last couple years was almost nonexistent and essentially took a backseat to James Jones towards the end of the year (as well as that white guy who made the Hail Mary catch whose name escapes me). But if Nelson has even a little of his speed and craftiness back then Aaron Rodgers’ favorite target will surely provide the kind of fantasy impact that few could match. Don’t be surprised to see 1400 yards, 10 scores, and a lot of annoyed fantasy owners )(that didn’t pull the trigger) by the end of the season.